Detroit Mayor Mike Duggan planned to have a lot more buses on the streets by this point. There’s been progress in some areas: more buses, better maintenance. But the bus system is still not reaching its goals. People crowd onto one of Detroit's new buses. Forty are in operation. Another forty are coming. Almost a year ago we asked bus riders in Detroit what they thought of the service and we got a mixed bag of responses. This month we got some of the same impressions. “No, I ain’t seen no change. They still slow. Still slow as hell,” Reginald Daniels said as he waited for a bus with his family at the downtown Rosa Parks Transit Center . “They’re more on time, a little bit faster, but sometimes they’re a little bit late,” student Aaron Gatewood said, sitting on a bench at a bus stop on Lafayette. “The buses ain't no better than they been," Rosemary Aikens said, adding, "You sit here two or three hours waiting for a dad-gum bus." A friend sitting next to her disagreed. “I can say it has improved and I do believe it will improve further more down the road,” argued Mary Smith. Her friend laughed at the statement. Things have changed. With some help from the federal government, there are brand-new buses running the routes. Forty new buses are operating now and another 40 are coming. So what’s the problem? Why are people still complaining about the buses? Yes, 40 buses were added to the fleet, but 69 old buses have been retired from service. It doesn’t sound like it, but that’s actually a net improvement because the new buses are more reliable. They don’t break down as often. They’re actually ready for service. And that brings us to the real problem. There are not enough drivers. “We’re almost 100 drivers short of our projected budget. And in order for us to run on-time service, we need to have positions filled or close to it,” said Detroit Department of Transportation Director Dan Dirks. He’s been trying to hire drivers ever since Detroit Mayor Mike Duggans hired him. There are some new drivers. Dirks just hasn’t been able to recruit enough drivers. There’s a new class of 29 in training now. That’s a bigger class than usual. He’s hoping after a couple more six-week courses, he will have enough drivers. That’s really optimistic. Even if the other classes end up with 30 trainees, only half to two-thirds of the applicants make it through the drug screening and six-week training program. That leaves him short of the nearly 100 drivers Dirks says he needs. The DDOT goal is to put 228 buses on the road during the PM drive. Even with new buses, the system has fallen short every day this year. (The dip in February reflects a heavy snowfall.) -From data provided by DDOT. But, if he manages to hire those drivers, Dirks says the Detroit bus system will be able to achieve the national standard which he says is 80% on-time performance. A public transportation watchdog doesn’t think that’s good enough. “If you don’t have at least 99%, if not 100% every single day of the buses that are scheduled to be out on the road actually out there serving people, that is crisis,” said Megan Owens with Transportation Riders United. She says for years the Detroit bus system only has been getting 60 to 80% of buses on the road. And the director of the Detroit bus system doesn’t argue with the fact it has to do better. “Yeah, I agree with the customers, but, you know, really, what’s the bus service? The bus service should be there on time and that’s, you know, the national standard is zero to five minutes,” said Dan Dirks. That regular, reliable service is critical if you depend on public transportation to get to work. Many people in Detroit cannot afford a car. Megan Owens says employers are reluctant to hire someone who relies on the bus to get to work because they’ll end up being late too often. "We do support the director, Dan Dirks, in his focus first and foremost on providing 100% of the service that is scheduled," said Megan Owens with Transportation Riders United. But she added DDOT needs additional service and better coordination with the suburban transit service SMART. That can only happen when there are enough drivers and enough dependable vehicles to put 228 buses on the streets each day to get 74,000 riders where they need to be on time – at least in Detroit. Getting beyond city limits on public transportation is a whole other issue. This quote resonates deeply with me these days, because in my Detroit neighborhood, the change I wish to see seems so far away. Imagining places that are clean, safe and vibrant threads my work as an urban planner and sustainability advocate. Yet, despite years of planning and designing these grand visions, my daily landscape doesn’t match the efforts. I know there’s still a long way to go, but I’m getting anxious. This week the Detroit Journalism Cooperative is looking at how the city is functioning under bankruptcy. Mayor Mike Duggan suggested he’d get a lot done in six months. We’re nearly there and took a look at progress with mass transportation in Detroit. One out of every three Detroit households doesn’t have a car. They rely on the bus system. But it’s broken. 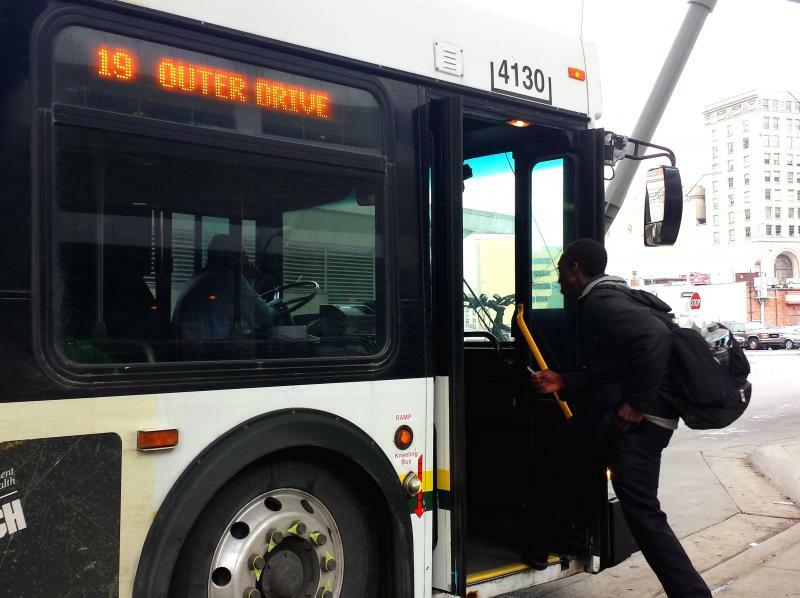 Detroit buses are being outfitted with new security cameras. Mayor Mike Duggan says the intent is to deter crime against passengers and drivers. “For far too long, our drivers have not been safe driving the buses. And at times our passengers have not been safe riding the buses,” says Duggan. Duggan says city bus drivers particularly don’t deserve some of the treatment they’ve been getting. Detroit Mayor Mike Duggan today announced what he says is the city's first major housing development in decades. 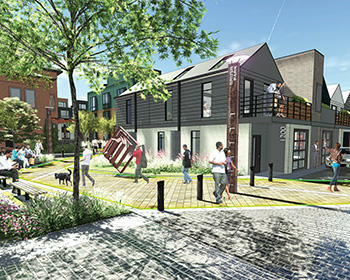 Some 330 houses, apartments, and retail units will be built in Brush Park, right on the edges of trendy Midtown and Downtown, and should have people living in them sometime in 2017. Demand for housing in those areas is booming. The developers are part of Dan Gilbert’s family of companies. Listen to Stateside's conversation with Michigan Radio's Jennifer Guerra. 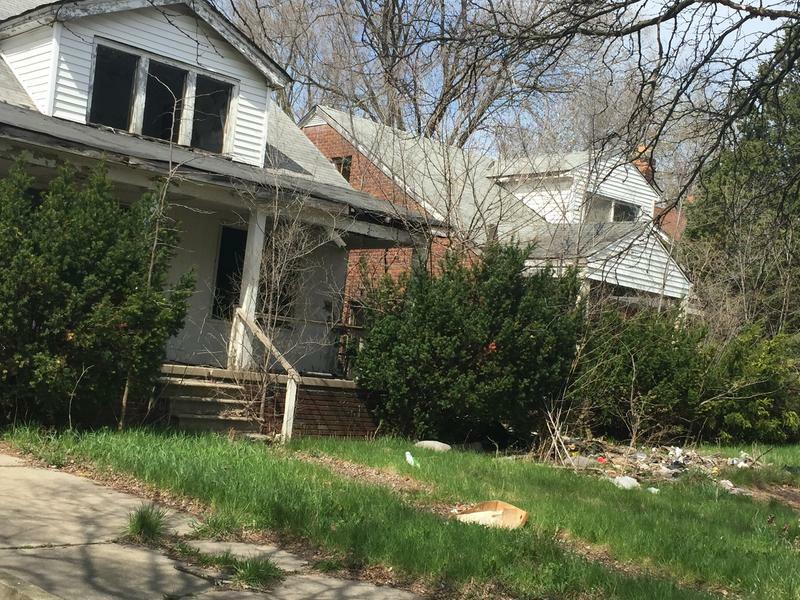 Where do students in a neighborhood struggling with blight, drugs, and gangs turn? If you're talking about students at Cody High School in Detroit, it’s to Coach Jimmie Knight.